We’d love your help. Let us know what’s wrong with this preview of Though This Be Madness by Penny Richards. Shakespearean actress turned Pinkerton detective Lilly Long and her reluctant partner, Cade McShane, travel to New Orleans to save a young widow from a fate worse than death "
"1881, Chicago." Assigned to her second case as a Pinkerton, Lilly still needs to prove herself both as a novice detective and as a woman in a man s world. Ordered to once again work with Lilly, Cade Shakespearean actress turned Pinkerton detective Lilly Long and her reluctant partner, Cade McShane, travel to New Orleans to save a young widow from a fate worse than death "
To ask other readers questions about Though This Be Madness, please sign up. 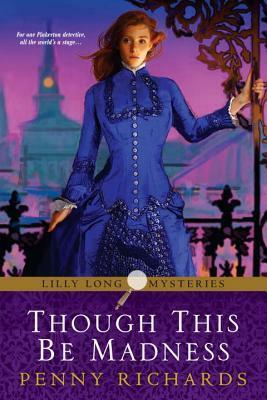 Having enjoyed the first book about a Pinkerton detective, Lilly Long, I was delighted to read her further adventures. In this book she goes to New Orleans with a fellow agent and they pretend to be domestic staff as they try to discover why a doctor has had his wife committed to a mental home. The similarity with journalist Nellie Bly won't be lost on many readers, but Lilly doesn't get herself committed. She has a hard enough time because we see all the domestic work of a multi-person househol Having enjoyed the first book about a Pinkerton detective, Lilly Long, I was delighted to read her further adventures. In this book she goes to New Orleans with a fellow agent and they pretend to be domestic staff as they try to discover why a doctor has had his wife committed to a mental home. The similarity with journalist Nellie Bly won't be lost on many readers, but Lilly doesn't get herself committed. She has a hard enough time because we see all the domestic work of a multi-person household, party and all. We also explore the personalities of Lilly, her fellow agents and a helpful street lad who pretends to be her brother in law. Good fun and always something happening. Start with a young female rookie Pinkerton agent, add a bit of a loose cannon male agent trying to redeem himself who has been instructed to teach her the ropes of being an agent while hopefully her presence keeps him out of further trouble. It is a partnership neither of them wants. Throw in a precocious 10 year old orphan who knows way more about the ways of the world than a 10 year old should know and hang on for the ride! Thoroughly enjoyed it! I swear at times I could smell food cooking, be Start with a young female rookie Pinkerton agent, add a bit of a loose cannon male agent trying to redeem himself who has been instructed to teach her the ropes of being an agent while hopefully her presence keeps him out of further trouble. It is a partnership neither of them wants. Throw in a precocious 10 year old orphan who knows way more about the ways of the world than a 10 year old should know and hang on for the ride! Thoroughly enjoyed it! I swear at times I could smell food cooking, beer and hear the sounds of wagon wheels on brick streets along with the soft rich patois of southern Louisiana speech. Penny Richards has again written a refreshing, easy read story with well developed characters and interesting places. In her second Pinkerton assignment, former actress, Lilly Long finds herself unwittingly paired with investigator Cade McShane in the guise of husband and wife. Their assignment? To find out why a member of the wealthy New Orleans Fontenot family was committed to an insane asylum by her second husband. Intrigue, betrayal, voodoo curses and murder will keep you guessing the outcome Penny Richards has again written a refreshing, easy read story with well developed characters and interesting places. Such a well thought out plot, I didn’t see the twist coming at all. Once again Penny Richards has done a wonderful job of creating a story that feels real, evokes true emotion, and makes you want more. THOUGH THIS BE MADNESS, the second novel in the Lilly Long Mystery series, begins almost immediately after AN UNTIMELY FROST leaves off. Pinkerton detective, Lilly Long, has just wrapped up her first investigation for the agency, and she barely has time to breath before she is sent off on an undercover operation in New Orleans along with her new partner. Agent Cade McShane has been working for the Pinkertons for years, and he is less than thrilled to be saddled with a young, inexperienced female THOUGH THIS BE MADNESS, the second novel in the Lilly Long Mystery series, begins almost immediately after AN UNTIMELY FROST leaves off. Pinkerton detective, Lilly Long, has just wrapped up her first investigation for the agency, and she barely has time to breath before she is sent off on an undercover operation in New Orleans along with her new partner. Agent Cade McShane has been working for the Pinkertons for years, and he is less than thrilled to be saddled with a young, inexperienced female agent. Lilly isn’t very happy about the arrangement either – especially since she and Cade will be posing as a married couple while working as servants in the wealthy Fortenot household. Mrs. Fortenot, an elderly widow, believes that her grandson’s widow has been taken in by her new husband and that he has sent her to an insane asylum in an attempt to wrest away the Fortenot family fortune that his wife inherited when her first husband died. It is up to Lilly and Cade to discover what is really going on in the Fortenot family. Overall, I mostly enjoyed THOUGH THIS BE MADNESS. The case itself is interesting, but, with Lilly and Cade working as servants in the household, it seems like the majority of their time is spent doing household chores instead of investigating. They also have a ten-year-old boy helping them, which seems a little farfetched. Robbie Jenkins’ main role in the novel is to do things that the adults wouldn’t be able to do, but it’s hard to wrap my head around the fact that the adults are even allowing a child (no matter how precocious and street smart he is) to help them out. While the plot does drag at times, other sections of the novel make up for it. The case, which seems almost mundane at first, begins to take twists and turns. There is a lot more going on than a nefarious man trying to get his hands on his wife’s former husband’s property and money. The budding romance between Lilly and Cade is intriguing. And Cade’s run-in with Lilly’s ex-husband also adds something to the novel. Overall, I enjoyed this book. I think it was fine that I had not read the first book of the series prior to reading the second book, although I likely would have preferred going in order (I generally do). The book was not too exciting -- I would say it had mystery, excitement, romance, etc. in doses, which I do not consider a knock, just a matter of preference. Womanlike, she was torn between anger that William thought she needed coddling and a purely feminine annoyance that Cade had no desire to work with her. Umm, what? Made all the worse by the fact that these are written in third person omniscient, and that one of the chief goals of the book is to say that Ms. Long cannot be put into that kind of box. Thank goodness there were not too many instances of these. I also found the issue of (view spoiler)[Ms. Long's ex-husband, Timothy Warner (hide spoiler)] to feel like a loose end, although my guess is that this will be left for follow up books in the series. The appearance felt a bit unnecessary though and did not do anything in particular for the story as far as I could tell. Just a gratuitous guest appearance. Lilly Long is off on her second assignment. This time she has an official partner, Cade McShane, who had watched over her during her first case. These two must learn how to work together as they travel to New Orleans for a case filled with secrets, betrayal, voodoo, and murder. As a sequel, this is a fantastic book. It builds on the first one in a brilliant way, allowing us to see that Lilly still has a lot to learn in her new profession. At times, she does seem too hard on herself, and that was Lilly Long is off on her second assignment. This time she has an official partner, Cade McShane, who had watched over her during her first case. These two must learn how to work together as they travel to New Orleans for a case filled with secrets, betrayal, voodoo, and murder. As a sequel, this is a fantastic book. It builds on the first one in a brilliant way, allowing us to see that Lilly still has a lot to learn in her new profession. At times, she does seem too hard on herself, and that was sad to see. I do wish the narrative had remained with her more, instead of moving to Cade as often as it did. It was necessary for the story to be told, but I want more of Lilly not Cade! As a side character, Cade is not bad, but he just didn't keep my interest in this book. For readers who enjoy a female detective using her skills to the best of her ability, this is a must read. I enjoyed the first book because there was no "love interest" per se for the heroine. I felt this aspect made this story very run of the mill. Also, the mystery itself is rather "easy" to guess once the clues are in place. I wouldn't have read this sequel if it was first in the series. I may not read the next one as the plot was predictable and weak, something I felt the first book was not. Assigned to her second case as a Pinkerton, Lilly still needs to prove herself to the agency. and herself. Lilly's not sure this will happen now that she finds she's working with another agent, Cade. In this novel Lilly travels to New Orleans and works as husband and wife servants to investigate suspicious activities at the Fortenot home. This is a readable cozy with an unusual premise. Former actress Lilly Long and her investigative partner Cade McShane are Pinkerton operatives in the 19th century post Civil War U.S. And unlikely and unwilling partners they are. Lilly is promising but inexperienced, and McShane has to atone for an earlier misbehavior, so they are yoked together in this 2nd series entry. Naturally, they are both drawn to and antagonistic to each other. They each carry substantial emotional baggage and stubborn independent natures. The pair has been sent to discover whether a New Orleans doctor who has his wealthy wife confined to an asylum is a manipulative fortune hunter or a concerned husband. Long and McShane, accompanied by a streetwise 10-year old, pose as a working class Irish couple and gain employment as servants at the family mansion. Almost immediately it is clear that all is not right in the household. Several sub plots run through the mystery. It felt like a fair amount of modern sensibility had been implausibly inserted here, but it didn't detract from the overall enjoyment of this book. A quick and entertaining read. This review has been hidden because it contains spoilers. To view it, click here. Lily is still learning the detecting business. Cade is teaching her things along the way-the most important one being work with your partner. Great read! Penny Richards also wrote romance novels under the pseudonym of Bay Matthews, and as Sandi Shane with the writer Sandra Canfield.